Cycling is a fun way to commute and stay fit but sometimes it can be hard to carry things with you while on two wheels. There are a few options when it comes to loading items on a bicycle, but carry baskets offer some nice advantages. Unlike backpacks, bike baskets take the weight off your shoulders and back. This in turn enhances airflow, so your back won’t necessarily be drenched in sweat after a long ride. What’s more, it becomes easier to glance over your shoulder when using a bike basket. Armed with the knowledge provided above, you can now start to look into various bike baskets with a good idea of what to expect. This guide will provide some suggestions to help you make an easy buying decision. 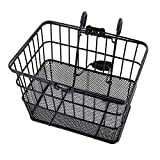 We will list top 10 best bike baskets that have earned the highest ratings from buyers. Read on to get the inside scoop on some of the leading brands and get to pick a bike basket with confidence. The Wald 582 bicycle basket comes in black, chrome silver or white color choices. It mounts easily on the back of an adult sized bicycle and allows you to carry two bags filled with groceries. 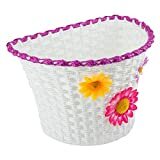 However, this metal wire basket is not ideal for carrying little items because of its relatively large openings. You can unmount it from your bike, but the lack of carrying handles would make it awkward to handle. As an added bonus, the Wald 582 rear bike basket folds up when not in use. The Sunlite rack top wire basket is one of the few rears mounted models that made it on our list of top 10 best bike baskets and with good reason. 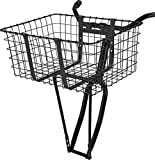 This basket is made of top quality steel with powder coating finish to prevent rust. The top 10 best bike baskets listed above offer a wide range of prices to suit any budget. However, there is more to choosing bicycle baskets than just considering the price. As you read about features of various bike baskets, it is important to identify which designs would best serve your needs. To cart groceries home from the supermarket, a removable, waterproof bike basket with handles, zippers or lid should come in handy. A lock could be a great addition to your bike basket if you are going to leave your bike unattended. Alternatively, opt for baskets that detach from the bike. This makes it easy to bring your personal belongings with you when leaving the bike locked up in a parking lot. Lastly, it is important to decide which mounting option you prefer in a bike basket. If you are the type of rider that wants easy access, a front bike basket is a way to go. Ideally, the basket’s opening should be wide enough so that you can easily insert or extract whatever items you intend to carry on the bike. Such baskets might improve handling but still, it is not practical to carry heavy loads in front of your bike. In addition, heaping too large of a load in a front basket could obstruct your vision. Baskets that mount on the back side of your bicycle may not be the most easily accessible but they are the best when carrying heavy items.